USA made with British Machines. Brad Cut Floor Board Nails. It is important that traditional nails are used to retain the authentic look and feel of the building as when it was first constructed. 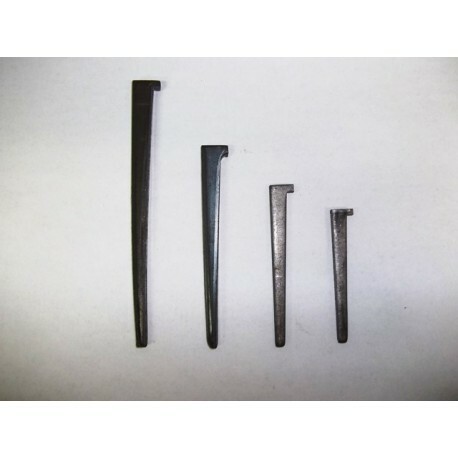 Our traditional cut nail products provide the fixing solution. Normally, cut nails are used in conjunction with wood. You will notice that cut nails all have a flat rectangular point. This allows the nail to punch its way through the timber fibers rather than causing the wood to split which often happens with diamond pointed round wire nails for example. It is important also to place the nail with the grain of the wood to avoid splitting. For larger nails we recommend that holes are pre-drilled in the timber slightly undersized from the width of the nail. When driving a nail through wood it is better to begin using short tapping strokes until the nail has a secure feel as it travels through the wood before applying heavier blows to drive it home. This should reduce the chances of bending the nail. If the nail is bent backwards and forwards several times because the nail has gone squint, the metal will be weakened and the nail may split leaving a broken point in the wood which may be difficult to extract. This issue is more relevant when 'hard' as a opposed to 'soft' wood is being used. Where a problem occurs pre-drilling as described above may be the answer. Clinching a nail means that the shank is bent over by 90 deg after the nail has passed through the timber to anchor the nail in place. This is possible when the nail is cut hot. Manufacture of cut nails involves a guillotine action on mild steel which means that cut nails have sharp edges on all four sides of the shank so care should be taken when handling the nails. The point of a cut nail is blunt. Very occasionally, a malformed nail with a sharp point might get through. If such a nail is found, it should be disposed of immediately in such away that will avoid injury.